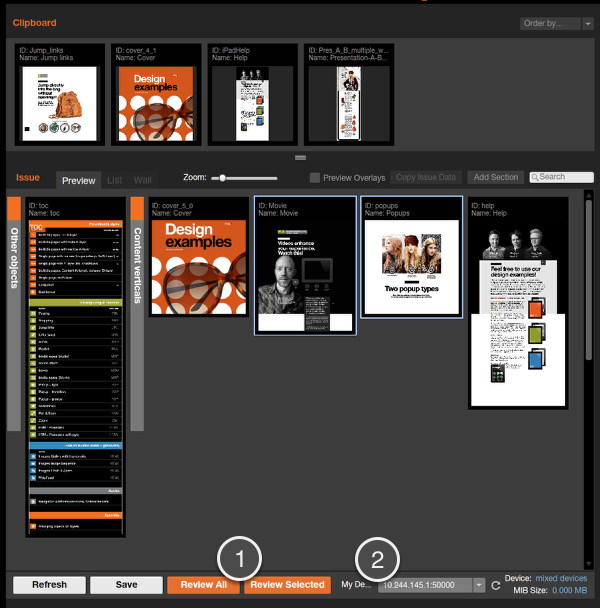 After exporting your layouts from InDesign to your Issue folder, you use the mag+ Production Tool to assemble them and create MIBs (mag+ Issue Bundles). You have the option of creating device-specific MIBs or universal MIBs that serve a range of devices. Completed MIBs are uploaded to the mag+ Publish portal and associated with an Issue. 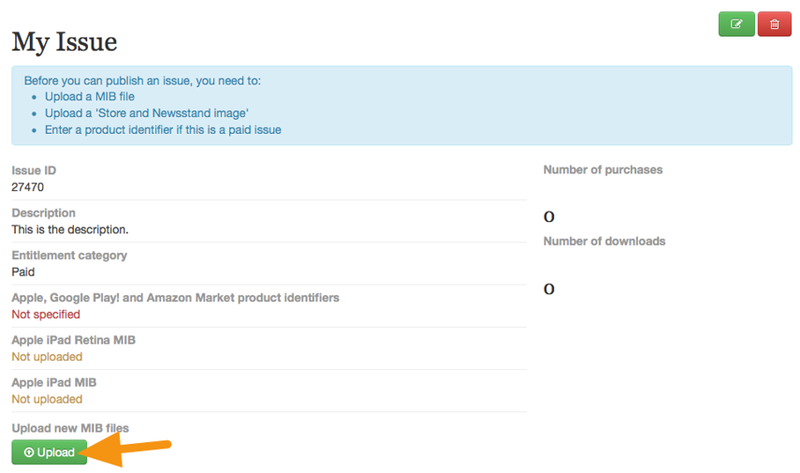 Your app then communicates with the mag+ Publish portal to determine what Issues are available to purchase or download. This article will walk you through some of the basics of laying out an Issue. 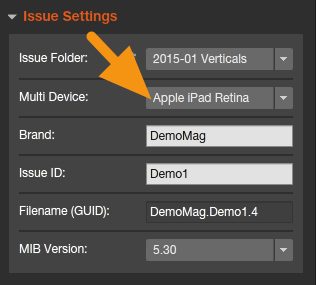 Make sure you have set-up your mag+ Production Tool with the correct Issue Settings for the Issue you are working on. For more information, please read the article "Setting Up the Mag+ Production Tool." 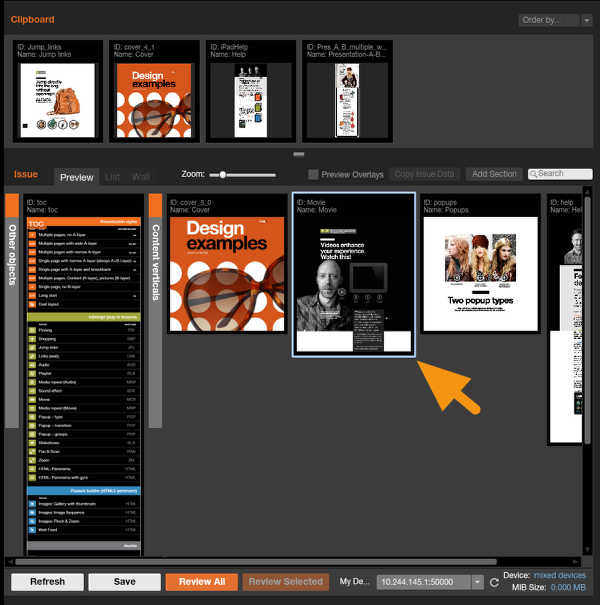 Your layouts from InDesign are exported as Mag+ Verticals. If your mag+ Production Tool is set-up properly, they should appear in the Clipboard area. If they do not appear immediately, you can click the "Refresh" button in the lower left-hand corner of the Production Tool. 1. Click and hold on the thumbnail of the Vertical in the Clipboard area. 2. Drag the Vertical into the Issue/Preview area. Note: You can sort Verticals in the Clipboard with the "Order by..." menu in the upper-right. 1. Click and hold on a Vertical's thumbnail in the Issue/Preview area. Note: The selected thumbnail will have a highlight color around it. 2. Drag the thumbnail to the new position. A translucent version of the thumbnail will follow as you drag (Label 1) and a destination bar (Label 2) will appear where the Vertical will get placed when you let go of your mouse button. 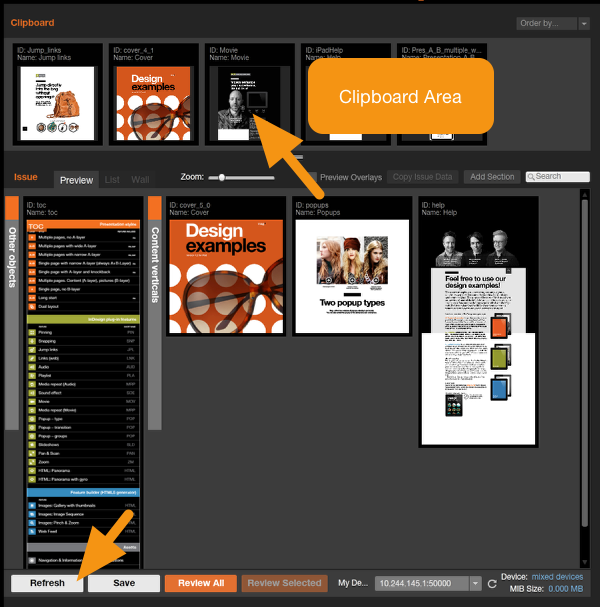 Note: You can also drag Verticals back to the clipboard if you mistakenly drag one down. Preview: This is the default view that shows the full length of the Vertical and includes a Zoom slider (Label 2) you can use to get a larger view of each thumbnail. List: A spreadsheet-like mode (shown below) that provides an easier way to double-check that all Verticals are included. You can sort Verticals in the List view by clicking on the column name (Label 3). Wall: This shows only the first page of a Vertical, but displays Verticals in multiple rows, letting you view more content at once. You can review individual Verticals or the entire Issue by clicking the appropriate button at the bottom of the Production Tool (Label 1). The review will be pushed to the Reviewer Device selected in the drop-down menu at the bottom of the interface (Label 2). 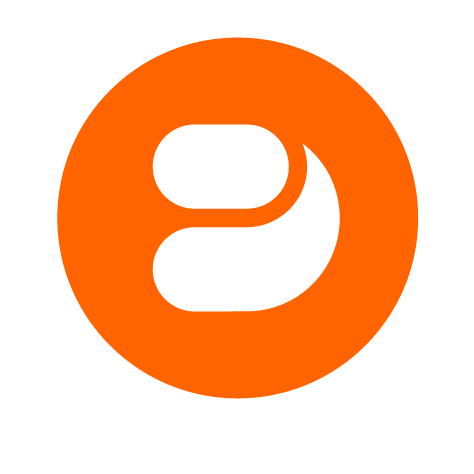 If you want to set-up a Reviewer Device with your Production Tool, be sure to download and install the free Mag+ Reviewer app from your device's app store. For more information, read the article "Setting Up and Using the Mag+ Reviewer." Note: You can select more than one Vertical by holding down the Shift key on your keyboard. To make changes to the content of your Issue, you can double-click the Vertical you want to change and it will open in InDesign (provided InDesign is installed on your machine). 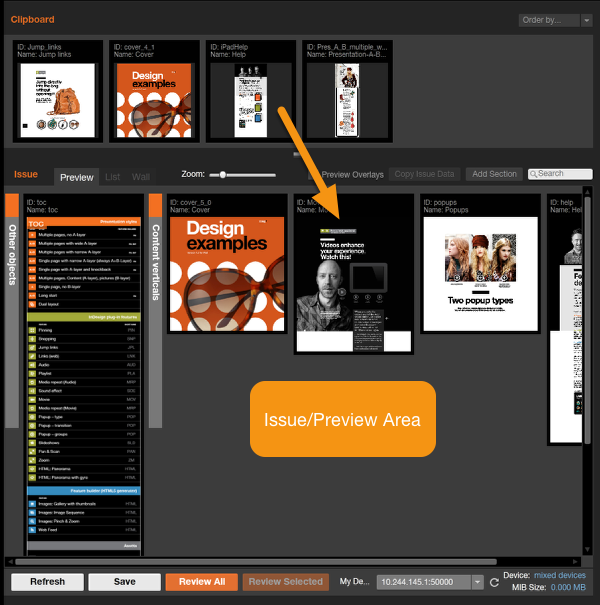 When done laying out your Issue, you create a MIB to upload to the Mag+ Publish portal. 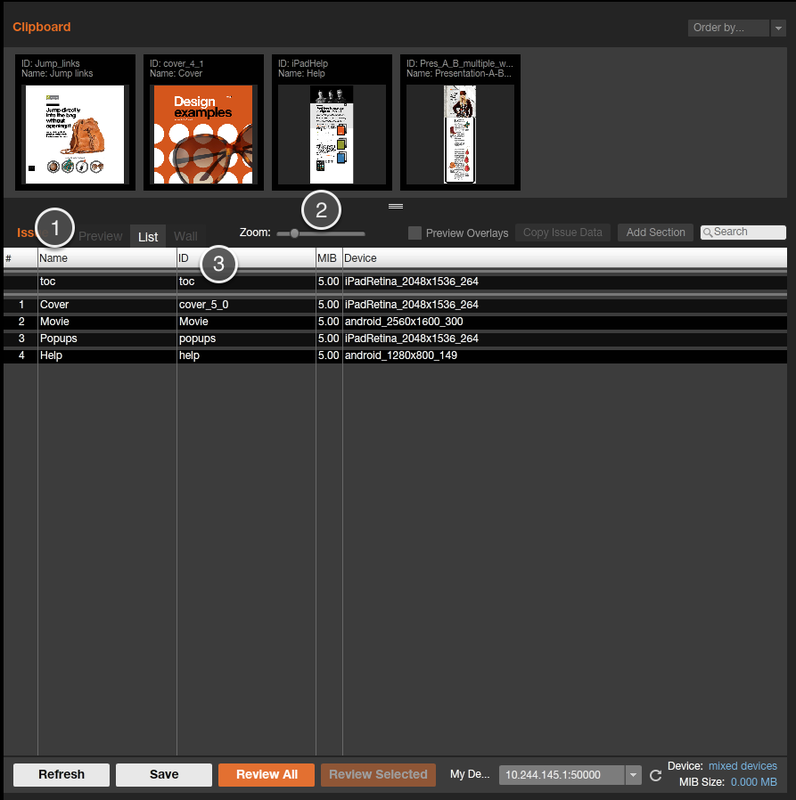 You can create a MIB for a single device or upload one MIB to be served to multiple devices. For more information on what device MIBs can be served to different devices, please read the article "Reference - Device and Issue Compatibility." 1. Make sure you have configured your Issue Settings for the device(s) you will be targeting with your MIB. 2. 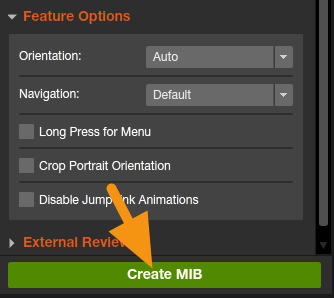 Click on the Create MIB button to generate a ".mib" file in your Issue Folder. 3. Take the ".mib" file that is generated and upload it to an Issue in the Mag+ Publish portal. Note: To learn more about creating Mag+ Issues and how to configure them, please read the article "Managing Issues." 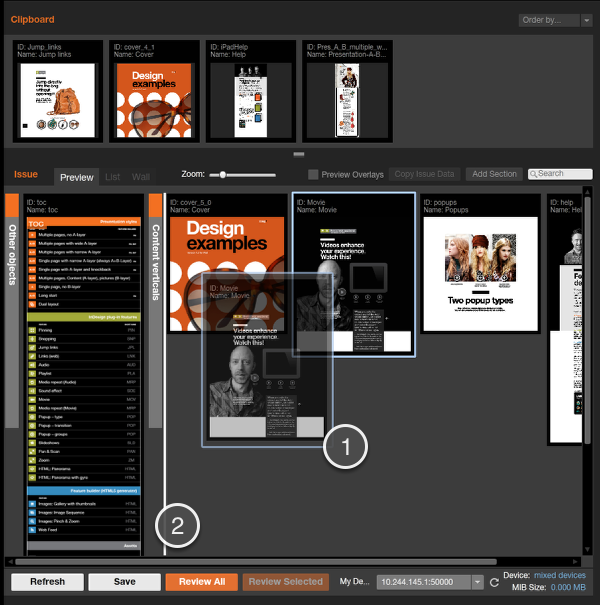 To learn about Overlays, please read the article "Creating an Overlay Layer." To learn how to create a Table of Contents, please read the article "Adding a Table of Contents." To learn how to create Sections and make use of the Bookmark feature, please read the article "Adding a Section and Setting a Bookmark." To learn how to set navigation options, please read the article "Setting Navigation Options."